The economy of the 17-nation eurozone grew by 0.2% between July and September compared with the second quarter, according to official data. The Eurostat statistics agency also recorded GDP growth for the 27-nation European Union at 0.2% in the third quarter of the year. Economists expect Europe's economies to slow sharply in the final quarter. The figures came as the difference between interest rates on French and German bonds reached a record. The gap between the yields - or implied interest rates - on German and French 10-year bonds widened to 1.726 percentage points. Meanwhile, the yield on the Italian 10-year bond rose back above 7% after a change of government in the country failed to reassure the markets. The Irish Republic and Portugal asked for international bailouts after their bond yields went past that level. Bond repayment rates are a key measure of market confidence in a country's ability to pay its debts. Germany is seen as the most reliable borrower in Europe. German shares closed the day down, with the Dax shedding 0.87%. In France, where there are greater worries about government debt, the Cac ended the day down 1.92%. Most of the growth recorded by the Eurostat statistics agency came from Europe's two biggest economies, Germany and France. The German economy grew by 0.5% in the July-to-September period, while the French economy grew by 0.4%, boosted by domestic demand, but France's second-quarter figures was revised down to show its GDP shrank by 0.1% in that period. In Greece, the economy shrank by 5.2% in the same period compared with a year ago, although that was not as bad as the 7.4% contraction of the second quarter. Later on Tuesday the new Greek government said it would submit plans to overhaul the tax system by early next year. "We must provide by the end of February... a widely accepted proposal on the new tax system," Finance Minister Evangelos Venizelos told parliament. 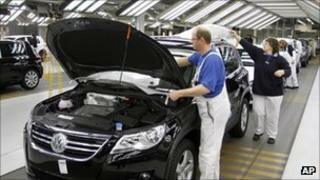 Eurostat said both the eurozone and the wider EU registered annual growth of 1.4%. Martin van Vliet, economist at ING, said: "The fact that the real economy still managed to grow amidst the escalating debt crisis is somewhat of a relief. "However, looking beneath the surface, things don't look so rosy." Jonathan Loynes, chief European economist at Capital Economics, said: "The key point is that this is all history. Forward-looking indicators suggest that the eurozone economy is likely to drop back into recession in the fourth quarter and beyond." The head of the European Central Bank, Mario Draghi, has also predicted a "mild" recession for the end of this year. On the financial markets on Tuesday, the yield on French bonds rose to 3.5%, while on German bonds it fell to 1.775%. That implies that France would pay about twice as much as Germany to borrow money if those rates were in force when the countries came to issue new bonds. The gap between the rate of return between Germany and Spain's 10-year bonds also hit a record of 4.522%. Spain paid sharply higher borrowing rates in its latest bond issue, with investors demanding more than 5% to lend the government money for 12 months and 18 months. At a previous auction in October, investors accepted less than 4%.